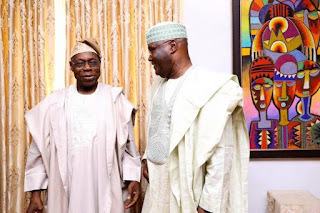 Home Politics Atiku Abubakar Celebrates His Former Boss, Chief Obasanjo At 82. Atiku Abubakar Celebrates His Former Boss, Chief Obasanjo At 82. Chief Olusegun Obasanjo & Atiku Abubakar. The Presidential Candidate of the People's Democratic Party, PDP and former Vice Preisdent, Alhaji Atiku Abubakar has come out publicly to celebrate and eulogize his former boss, Chief Olusegun Obasanjo who turned 82 years old today. A very happy 82nd birthday to you, Chief Olusegun Obasanjo. No living Nigerian has given as much to Nigeria in peacetime and in war as much as you have. May God Almighty, Atiku says, grant you many more years in good health and continued service to Nigeria and the world at large. It would be recalled that Atiku Abubakar's presidential mandate was stolen in the last election which the incumbent, President Muhammadu Buhari claims to have won. Congratulations to Chief Olusegun Obasanjo.